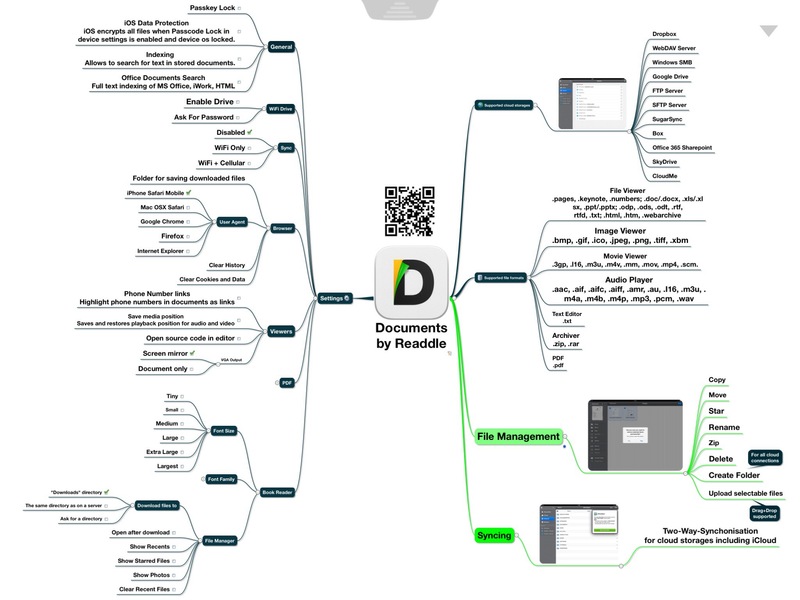 Documents by Readdle (USA) is a universal app for iOS devices and intended to support file management. The developer is a reliable company updating it’s products regularly since years. File sharing is an indispensable requirement for collaborating, backing up relevant files and continue working on other devices. For private and business environments the following features should be provided by apps for the iPad and the iPhone. In computer networking, Server Message Block (SMB), also known as Common Internet File System (CIFS) operates as an application-layer network protocol mainly used for providing shared access to files, printers, serial ports, and miscellaneous communications between nodes on a network. Not only does SMB allow computers to share files, but it also enables computers to share printers and even serial ports from other computers within the network. For example, a computer connected to a Windows network could print a document on a printer connected to another computer on the network, as long as both machines support the SMB protocol. Though SMB was originally developed for Windows, it can also be used by other platforms, including Unix and Mac OS X, using a software implementation called Samba. By using Samba instructions, Mac, Windows, and Unix computers can share the same files, folders, and printers. This is great for those Windows-based office networks where there is a graphic designer who refuses to use anything but a Mac and a tech guy who does everything on his Linux machine. Feel free to download this map from my Box account. The alternative file formats have been created with iThoughts HD for iPad (.ITMZ file format). Compatibility to other tools is limited. Of you use Apple’s iWork Suite and activated iCloud to sync your documents across all of your devices it might be useful to add an additional security layer for important documents. Why? Well, if you accidentally delete an iWork document on one of your devices it will we deleted from all of your devices. Apple’s document management in iCloud doesn’t support the recovery of deleted documents. So it’s worth saving documents at an additional place. You can do it by using the ‘Send a copy’ command within iWork and send a copy to an additional cloud storage which is accessible via WebDAV e.g. Box net, iDriveSync, etc. In many cases users prefer a Dropbox account (because the majority of apps support Dropbox) but there is still no chance to access Dropbox via WebDAV. The alternative is the usage of the ‘Open in another app’ command within the iWork Suite and choose ‘Documents’ as the destination application. If doing so Apple’s operating system moves a copy of your document to the app specific folder of Documents. An unwanted deletion of an iWork document then doesn’t affect the copy which has been saved in the documents folder of Documents. For the reverse way, from Documents to iWork, you also can use the ‘Open in’ command from within Documents. 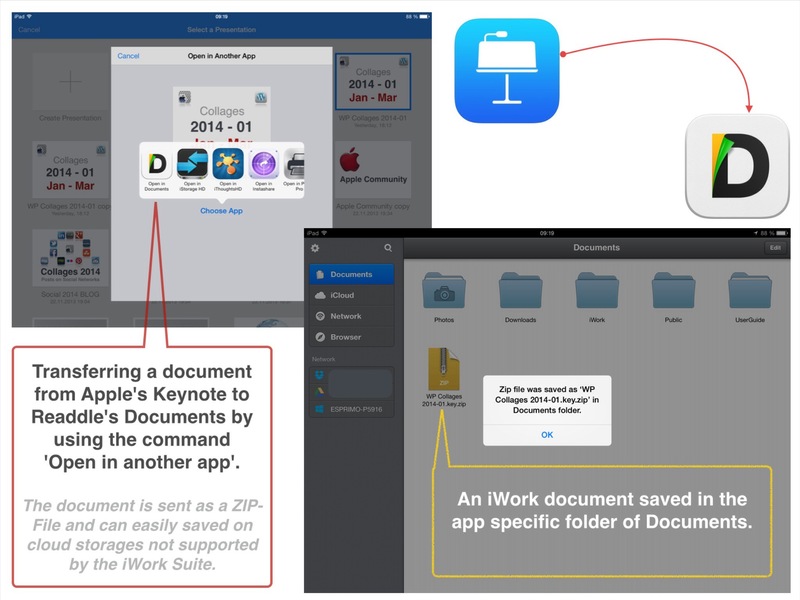 Additionally you can activate syncing within Documents so that the copies of your iWork documents are synced with your preferred cloud storage. Keep in mind that all documents saved in the app specific folder of Documents are only accessible on the device which contains the copy. You have to activate iCloud for Documents to automatically sync data of Documents with the app related part of your iCloud account. iOS encrypts all files when Passcode Lock in device settings is enabled and device os locked. Documents by Readdle is an app with a perfect UI following Apple’s iOS Human Interface Guidelines. The developer is continuously improving it’s apps. Another noteworthy app of the company is Scanner Pro also operating on a high quality level with a perfect UI. Apple’s iWork Suite, Documents, and Scanner Pro together build a powerful extension of features on an iPad and an iPhone.